Granite Staters received 9.7 million robocalls in July, an increase of 53.9 percent or 3.4 million calls when compared to the same time last year, according to YouMail, a provider of cloud-based telecommunication services that offers a free service to stop robocalls. Nationwide, Americans were overwhelmed by an estimated 24.3 billion robocalls in the first seven months of the year, an increase of 41.3 percent year-over-year. However, July was a reprieve for some, as the total robocalls declined 3 percent nationally from June to July. 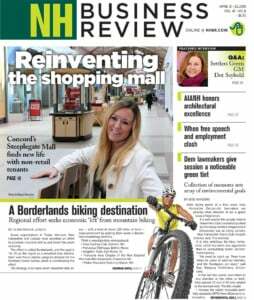 That was not the case for individuals with a 603 area code, who experienced a 14.8 percent jump alone from June to July 2018, ranking New Hampshire among the states with the largest increases. Other states with significant increases were South Dakota (up 15.3 percent), Maine (6.7 percent), Vermont (6.6 percent) and Montana (5.2 percent). According to YouMail, on average an individual in New Hampshire receives 7.9 calls a month. Eighty percent of the country’s top 20 robocalling phone numbers nationally were made by debt collectors including banks, cable companies and retailers. Other calls originated from phone lines for a health insurance scam, a bank card scam and a business loan scam. (Nationwide, 36 percent of all robocalls in July were scams.) And one national credit card company has retained the most active robocalling phone number with 40.8 million calls placed nationally in July alone. 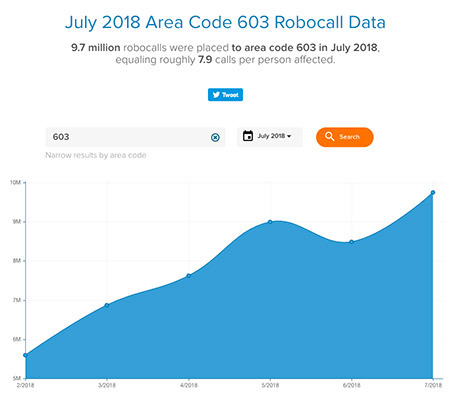 All major carriers tracked by YouMail — AT&T Wireless, T-Mobile, Verizon Wireless and Sprint — are seeing the number of robocalls per subscriber go up. For an overview of the top 20 robocalling numbers targeting 603 numbers, click here and scroll down.